(NaturalNews) Eating a diet high in processed foods, sugary treats, refined carbohydrates and especially grilled meats such as hamburger immediately raises damaging levels of inflammation throughout the body, prompted by the release of the protein Interleukin-6 (IL-6). Researchers use measurements of serum IL-6 to determine systemic inflammation throughout the body and have determined it is an effective gauge to assess the risk for developing many chronic illnesses including cardiovascular disease, diabetes, cancer, dementia and metabolic syndrome. A research team from the University of California has published the result of a study in the journal, Food and Nutrition to provide evidence that consuming half of a fresh avocado with a burger may counteract the protein IL-6, as compared to eating a burger without the vegetable. Avocados have been maligned as a health-promoting food for decades due to their high fat content. Extensive research over the past several years has fully vindicated the vegetable, and clinical trials are now being conducted to examine the association between consuming avocados and the possible beneficial role in weight management and chronic disease risk reduction, along with determining the vegetable's capability to increase the absorption of nutrients. The study involved a cohort of healthy males between the ages of 18 and 35 years. The men were fed a meal consisting of a hamburger with no avocado. Blood serum levels of IL-6 were sampled four hours after eating, and researchers found the volunteers experienced a significant increase in the inflammatory protein of 70 percent. This spike is similar to the level observed when a person is fighting a bacterial or viral pathogen. IL-6 typically drops in a healthy person as the infection is controlled, but many people consuming a diet high in inflammatory foods never experience a return to normalized levels. When the men were fed the same hamburger meal along with one half of an avocado, IL-6 levels were controlled at 40 percent. 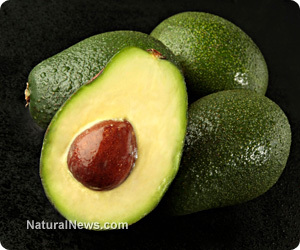 Researchers observed that triglyceride levels were not raised when adding the avocado. This is important as elevated triglycerides are directly associated with increased risk of arterial plaques and associated cardiovascular disease and heart attack risk. Further, the scientists found that measures of peripheral blood flow were reduced by 27 percent after eating the burger alone, yet did not change significantly after consuming with avocado. The lead study author, Dr. David Heber concluded "This study supports the hypothesis that fresh avocado may help support normal vascular function, which is important for heart health... some of the after-meal effects observed after eating the plain burger, specifically inflammation and narrowing blood vessels, were reduced within hours, and triglycerides did not increase beyond what was observed after eating the burger alone." This study supports a wealth of recent scientific publications demonstrating the importance of combining raw and lightly steamed vegetables with less healthy food choices to significantly lower the risk of heart disease and chronic illnesses.